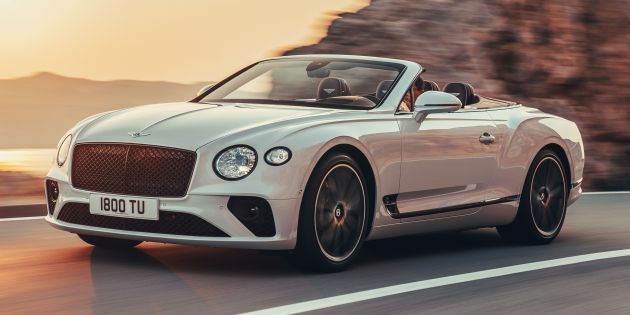 Bentley has unveiled the new Continental GT Convertible, which is the alternative body style to the third-generation coupe model that made its debut last year. Just like the hardtop, the GTC is powered by a 6.0 litre twin-turbo W12 engine that makes 626 hp and 900 Nm of torque, so any compromise in performance is largely negligible. For further proof of this, Bentley says the GTC will complete the zero to 100 km/h sprint in 3.8 seconds, which is only one tenth of a second less than the coupe. Both models will hit the same top speed of 333 km/h, although the GTC does so while carrying 160 kg more weight due to the powered Z-fold roof. Said roof is touted as a significant improvement over the previous-generation GTC model both in terms of refinement and packaging, whereby the former sees a three-decibel reduction in noise levels compared to its predecessor at typical cruising speeds. Deploying or retracting the roof takes just 19 seconds, and you can do so at speeds of up to 50 km/h. As customers have different preferences, Bentley offers seven fabric hood colours to choose from, including an authentic tweed finish for the first time. Depending on the observer, you’ll either welcome or resent the redesign of the GTC’s roof, window and rear deck to make way for the folding roof. The GTC’s body-in-white structure is both 5% stiffer and 20% lighter than its predecessor thanks to the use of aluminium and high-tensile steel in the platform. It also gets similar systems like the Continuous Damping Control (CDC), Bentley Dynamic Ride, Electric Power-Assisted Steering (EPAS) and 28-piston braking system fFront calipers feature ten pistons each, while rear calipers contain four pistons each). 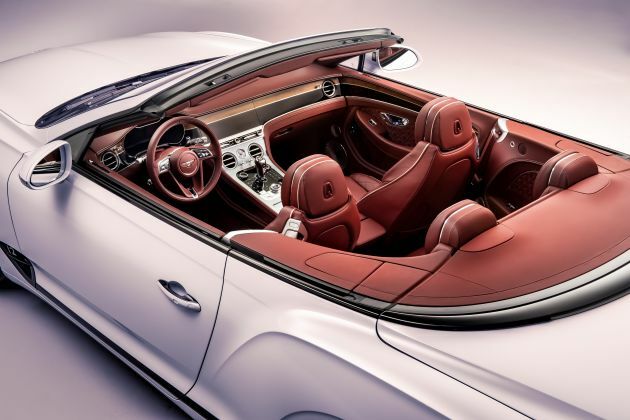 Bentley is marketing the GTC as the “pinnacle of open-top luxury grand touring,” so while there is quite a bit of performance on tap, it isn’t the only focal point. The interior is awash with high-quality leather, sustainably sourced veneers, pillow- and diamond-knurled switchgear, as well as other premium materials add to the sense of occasion upon entry. There’s also a list of convenience features available, including the familiar Bentley Rotating Display, which comes with a 12.3-inch touchscreen housed in a three-sided unit, which revolves from pure veneer to reveal either a touchscreen or three analogue dials. You’ll also get to enjoy 20-way Comfort Seats that comes with ventilation, heating and massage functions, and can be ordered with Hand Cross Stitch finishing. More options involve the three available audio systems, with the standard fitment being a 10-speaker, 650-watt setup. This can be upgraded to a 16-speaker, 1,500-watt Bang & Olufsen system, or a more advanced 18-speaker, 2,200-watt Naim system. Of course, personalisation is commonplace in the world of luxury automobiles, so Bentley offers 17 exterior paint colours, with up to 70 hues available in the extended range. There are also 15 luxurious carpet options, eight different handcrafted veneers (with a further four dual veneer options) and 15 choices of interior trim hide. This doesn’t include even more detailed touches like personalised stitching, personalised treadplates, and the what wheels you want fitted – 21-inch five tri-spoke (standard), 21-inch ten-spoke and 22-inch five open-spoke alloys. You would have to wear a helmet to travel 333km/h with the top down. Now that is a great commercial. The highlight was definitely the soundtrack woven with the engine/exhaust note. that middle a/c vents sits so low it will eat your phone, cards, keys, etc.